Tomato Soup Shooters with Mini Grilled Cheese are fun appetizer that can be served at parties, for entertaining, baby showers or weddings. They’re comfort food in small bites. I hope everyone had a lovely Christmas. Now that Christmas feasting is over, it’s time for New Year’s Eve party food. Who doesn’t love tomato soup and grilled cheese? Wow your party guests with this comfort food appetizer, tomato soup shooters with mini grilled cheese. These Tomato Soup Shooters with Mini Grilled Cheese can be prepared a few days in advance. I made the soup and kept it refrigerated for a couple of days and reheated when I was ready to serve and I think tastes better because the flavors develop. The mini grilled cheese can be made in minutes. I used Jewish rye because I love the flavor of the rye with the sharp cheddar and soup. The best way to butter the bread for cooking them is melt the butter first, then you can brush the butter evenly on the bread. I served the soup in a variety of different shaped shot and cordial glasses. This makes for a pretty presentation and the height differences give more dimension to your party table along with rosemary sun-dried tomato olives and a pear ginger champagne cocktail. 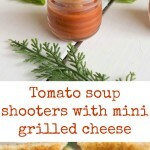 If you’ve tried this Tomato Soup Shooters with Mini Grilled Cheese or any other recipe on the blog then don’t forget to rate the recipe and let me know how you got on in the comments below. I love to hear from my readers! You can also FOLLOW ME on FACEBOOK, TWITTER, INSTAGRAM and PINTEREST to see daily recipe updates. Tomato soup shooters with mini grilled cheese are fun appetizer that can be served at parties, for entertaining, baby showers or weddings. They're comfort food in small bites. In a large saucepan, heat the olive oil over medium heat. Add the onions and sauté for 3 minutes until they start to soften. Add the basil, tomatoes, stock, salt and pepper to the pan and stir. Bring to a simmer and cook for 30 minutes. Use an immersion blender or blender, blend until smooth (blend in small batches as the hot soup can expand and overflow. Taste for seasoning and adjust to taste with salt and pepper. Set aside. Preheat a large sauté pan or grill pan over medium low heat. Butter the bread slices on 1 side. Lay them out, butter side down. Add an even layer of cheese. Put the other piece of bread on top, butter side up. Add the bread and cheese to the pan and cook until the cheese starts to melt and the bread is golden brown, turn and repeat. Cut off the crusts and cut the grilled cheese into triangles. Pour the tomato soup into shot glasses and top with the mini grilled cheese. 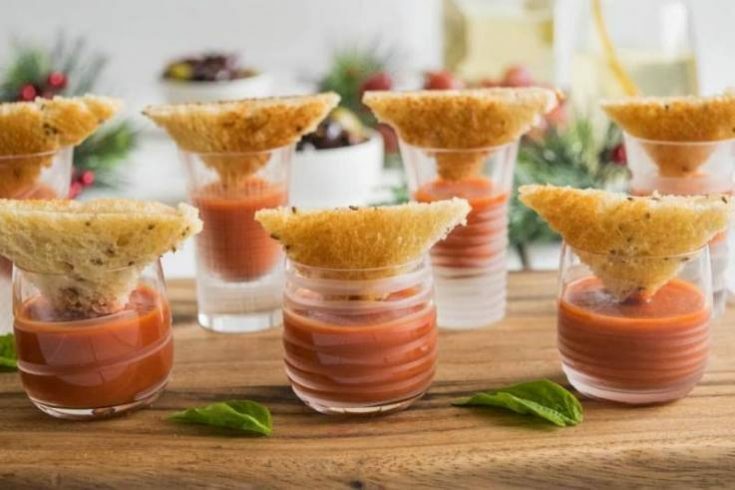 How adorable are these Grilled cheese and Tomato Soup Shooters! Plus, anything tomato related and you have my full attention. I have tried Jewish Rye bread in sandwiches, but, this will be the first time I try it in a Grilled Cheese. I love these awesome looking adorable little appetizers! And I bet they are super yummy! Thanks so much for the idea. I’m hosting a small get-together for New Year’s Eve, and these would be great! This is such a fantastic idea! I can just picture guests picking up these little beauties and taking a bite of the grilled cheese and a shot of tomato soup! Brilliant! Tomato soup and grilled cheese has never looked sexier! Love these, Janette and would love to be served one at a party. Hope you’re having a fun time! Merry Christmas and a Happy New Year! These are so cute and perfect for a party! Super YUM! You really knocked it out of the park with this one Janette! Stunning, delicious, comforting and FUN! Hi Janette! I love it! What a great idea. I can’t wait to try this. Thanks for sharing. Pinning it! I LOVE this. Nothing more comforting than tomato soup and a grilled cheese sandwich! These look SO CUTE!! I’m definitely putting them on the list of aps to make for our next party. Pinning! Great Christie, I hope you enjoy them, they’re fun and tasty.